Kevin Hillstrom: MineThatData: What To Do? What To Do? Time for you to put your strategic hat on and be a CEO, ok? Let's pretend you were Glenn Glieber, the CEO at Gliebers Dresses. You're not watching Jeopardy on your DVR, you are actually trying to fix your business. You are dealing with many different issues. You made new merchandise mistakes in 2016 that are hurting you in 2017. Existing merchandise is generally dying, due in part to odd decisions on behalf of the merchandising team. 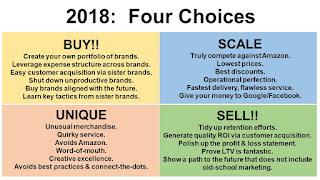 The catalog co-ops are dying, and Google/Facebook are becoming too expensive to be meaningful large-scale customer acquisition channels. As a result, new customer acquisition via "plug-and-play" channels that require no creative knowledge is in free fall. Gliebers Dresses is trying to compensate for this issue by doing more reactivation marketing ... but then the marketing is uninspiring (i.e. mail more catalogs). The customer base aged, and that's a bad thing not so much because the customer is old but because the customer has specific merchandise preferences (stuff older customers like) and that means that when online marketing actually works the younger prospect visits the site and says "THIS IS STUFF FOR OLD PEOPLE" and she bounces and then the online marketing wonks tell Gliebers Dresses how to do things to optimize the site that won't work because the 64 year old customer who likes the site doesn't want the site to change. 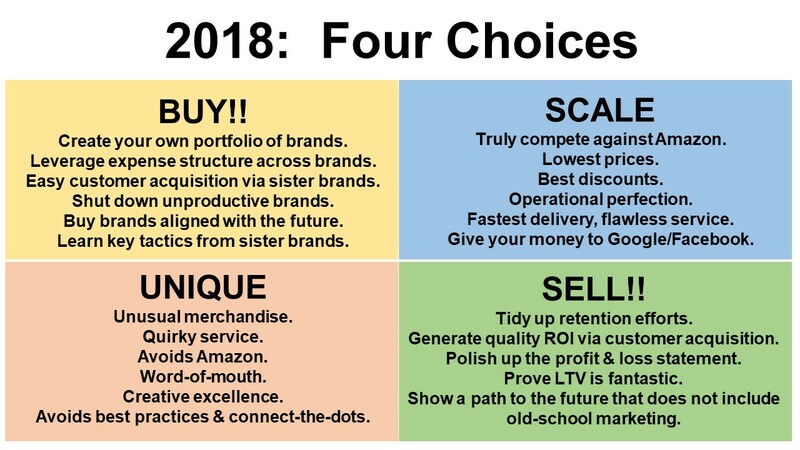 You cannot become a "digital brand" unless you are targeting a "digital customer" and you aren't doing that selling fashion that appeals to a 64 year old customer. It's not like Gliebers Dresses has a ton of cash to go out there and buy other brands. Gliebers Dresses is never going to "compete with Amazon". Ever. Gliebers Dresses had more than 40 years to figure out how to scale and failed to do so. Gliebers Dresses COULD become a "UNIQUE" brand. The merchandise could be whimsical. Catalog copy could be enjoyable, readable, and not a description of the item. They could sell space in the catalog to other brands, almost becoming a media company. They could advertise in a manner complementary to Duluth Trading Company (sans humor). They could provide outstanding customer service ... a curated experience like Stitch Fix or they could become the Nordstrom of online service. They could work hard to create word-of-mouth. It would require a complete re-think as to how to build a marketing department. Or they could spend the next 18 months preparing to sell. I hear Potpourri Group is in a buying mood. Fix the p&l, and allow Glenn Glieber to head off into the sunset in Suburban Phoenix, where temperatures average in the mid-upper 70s in March. Put on your CEO hat. Tell all of us what you would do? I'll publish credible answers to this question.